The purpose of this study was to measure whether a group of upper-level elementary students enrolled in a school with French and Spanish foreign language immersion programs display higher levels of intercultural sensitivity (ICS) than peers in an English-medium school. The particularity of these full foreign language immersion programs is the use of the foreign language for 50-100% of the time to teach native speakers of English the regular curriculum. One approach to measuring ICS is grounded in the Universal-Diverse Orientation (UDO) construct (Miville, Gelso , Pannu, Liu, Touradji, Holloway, et al., 1999). Using this construct, an instrument—the Miville-Guzman Universality-Diversity Scale—was developed to quantify the degree to which specific features of ICS exist in an individual learner. The tool consists of three subscales that assess: (a) the diversity of contact sought out with others, (b) the relativistic appreciation of oneself and others, and (c) a sense of connection with the larger society or humanity as a whole; i.e., comfort with differences. Table 1 provides a demographic overview of the eighty-two 4th grade students who participated in this study. Students were asked to complete the short form of Miville-Guzman Universality-Diversity Scale after supplying demographic information for this quasi-experimental research design. The experimental group was composed of forty 4th grade students enrolled in a full foreign language immersion program, some in French, others in Spanish. The control group included forty-two 4th grade students attending a mainstream, English-medium program. Both student groups were part of a large urban independent public school district in Oklahoma. Six one-way analyses of variance (ANOVA) to compare the means of the samples were calculated (see Table 2). The first compared immersion boys with non-immersion boys on subscale 1 (diversity of contact). There was not a significant difference between these two groups (p = .408). The second ANOVA compared immersion girls with non-immersion girls on subscale 1. There was not a significant difference between these two groups (p = .180). The third ANOVA compared immersion boys with non-immersion boys on subscale 2 (relativistic appreciation). There was not a significant difference between these two groups (p = .529). The fourth ANOVA compared immersion girls with non-immersion girls on subscale 2. There was a significant difference found (p = .007). The fifth ANOVA compared immersion boys with non-immersion boys on subscale 3 (comfort with differences). There was not a significant difference found (p = .297). The sixth ANOVA compared immersion girls with non-immersion girls on subscale 3. A significant difference was found (p < .001). Since six ANOVAs were run the alpha was adjusted from .05 down to .008. The results indicated that two intercultural sensitivity subscale levels (relativistic appreciation and comfort with differences) were significantly higher among female students participating in foreign language immersion programs when compared with female non-immersion students. 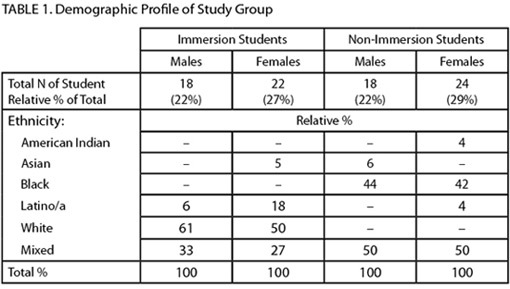 These findings suggest that girls may benefit more from the immersion experience than boys in the area of intercultural sensitivity and appear more likely to become open to differences. 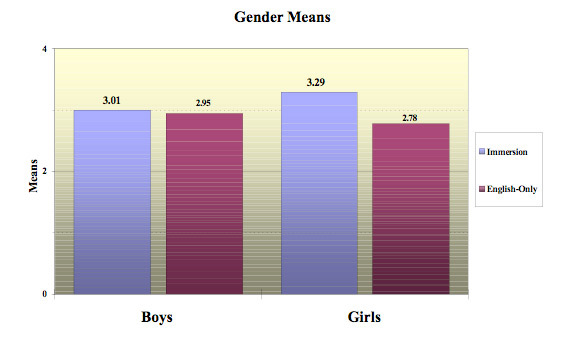 Additionally, when the means of composite scores are analyzed (see Figure 1) girls in the English-medium school scored the lowest of all four groups, indicating that as a group they were found to have the smallest amount of intercultural sensitivity. A look at the demographics of the participants and a comparison between the two schools further shows that the sample varies greatly in terms of ethnic background. The majority of language immersion students are white and Latino, whereas the majority of the non-immersion students are of mixed ethnicity or Black. A larger sample would provide more reliability in the results. It would also be interesting to further examine the role of ethnic background and gender in the development of ICS. Findings from this small-scale study seem to indicate that immersion programs may foster a positive sensitivity toward other cultures for girls. Results from previous studies conducted with older students in traditional language classes (e.g., Ward & Ward, 2003) and linguistically and culturally diverse elementary students in two-way immersion (Lindholm, 1994) have also found students participating in language programs to display positive cross-cultural understanding. More research is needed to better understand how intercultural sensitivities are developed with children in an immersion program and how educators might maximize this type of learning in their classrooms. Cross-cultural awareness and multicultural competence are increasingly important in our global society. Programs such as foreign language immersion have the potential to play a significant role in educating children who are able to appreciate and interact more effectively with people from other cultures at an early age. Enhanced cross-cultural awareness may, in turn, help reduce racism and cultural intolerance in our multi-ethnic society and in so doing, contribute to the country as a whole. Lindholm, K. J. (1994). Promoting positive cross-cultural attitudes and perceived competence in culturally and linguistically diverse classrooms. In R. A. Devillar, C. J. Faltis, & J. P. Cummins (Eds. ), Cultural diversity in schools: From rhetoric to practice [Electronic version.] Albany, NY: State University of New York Press. Miville, M. L., Gelso, C. J., Pannu, R., Liu, W., Touradji, P., Holloway, P., et al. (1999). Appreciating similarities and valuing differences: The Miville-Guzman Universality-diversity Scale. Journal of Counseling Psychology, 46 (3), 291-307. Ward, M. J., & Ward, C. J. (2003). Promoting cross-cultural competence in preservice teachers through second language use. Education, 123 (3), 532-536. Retrieved July 10, 2004, from Expanded Academic ASAP database.